The answer to the question, "How do the French celebrate Easter?" is that it is similar to Easter celebrations in other primarily Christian countries, but the French also have their own Easter traditions. Perhaps unsurprisingly, given France's prime culinary talents, many of the Easter traditions include food. Easter is a longer holiday in France than it is in the United States. While the U.S. observes Easter Sunday as a holiday, Good Friday and Easter Monday are typically not recognized. In France, Easter always consists of a long weekend, and in some sectors, a week or two of vacation centered around the long weekend. In addition to having the chance for a holiday, the French also take the opportunities of Easter to include visiting family and/or friends, and relaxing a considerable amount. What Do French People Eat? Like in many countries, French children have Easter egg hunts on Easter morning. 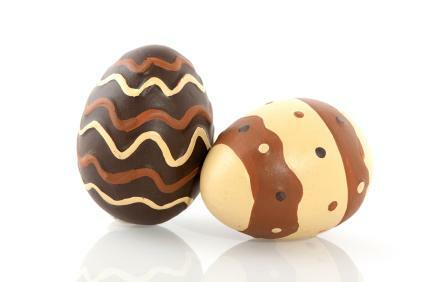 Eggs are usually chocolate ones and not hard-boiled ones, although the French also play games with raw eggs on Easter. A few Easter games exist, such as competitions throwing and catching eggs and seeing who can toss and catch an egg the longest without breaking it. Another game with raw eggs stems from the Catholic tradition in France. In this game, children each take a raw egg and roll them down a hill (simulating the stone rolling from Jesus' tomb). In this symbolic game, the child whose egg travels the farthest without breaking is the winner. Easter egg hunts are usually for small, unornamented chocolate eggs. However, French chocolatiers also have a long-standing tradition of creating oversized ornamental chocolate eggs that are given as gifts. These eggs, like most products from French chocolatiers and patissiers, often look too beautiful to eat! There is a French Easter tradition of serving lamb as the main course on Easter. While this is not necessarily always the case, many families still observe this tradition by making a rack of lamb braised with an herb rub or sauce on Easter. Other main courses would typically be a meat main course, for example a ham or other choice cut of meat. Turkey, which is very typical of Christmas, would not often be chosen as an Easter main course. Easter is an important holiday in France and has several traditions, both religious and secular, that go along with Easter. Be sure to wish all your friends and/or colleagues joyeuses Pâques (Happy Easter) around this time of year.